Upper West presents “IMAGINATION," a solo exhibition by Maureen Tepedino. The opening reception takes place from 4:00 pm to 7:00 pm on Sunday, April 22nd. 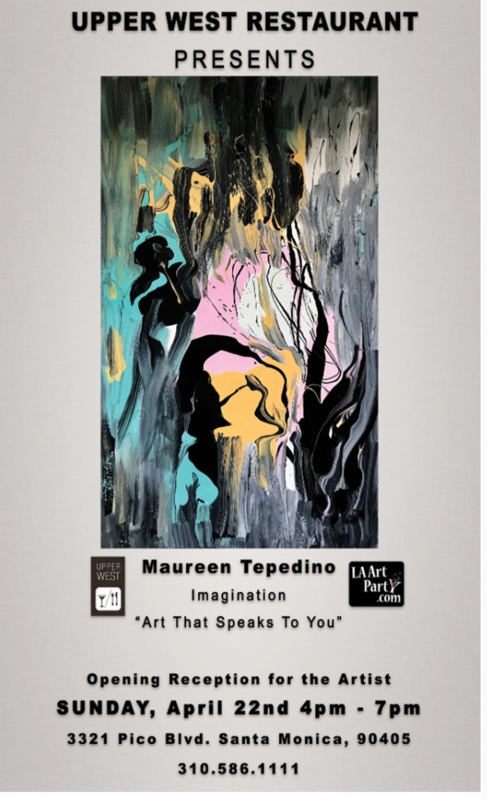 Tepedino continued, “I have enjoyed looking at the abstract art on the walls at Upper West which adds to the ambiance of the restaurant!" Although she has not attended any of the artist openings, she said she is looking forward to having her work exhibited at the Upper West. Her paintings are sold nationally by interior designers, art consultants, architects and contractors for high-end residential and corporate projects. She also specializes in corporate art by creating original pieces designed for commercial spaces.